During five stops across Tampa Bay on Saturday, Gillum’s supporters seemed as fired up as ever, despite lingering questions. OCTAVIO JONES | Times Mike Suarez, Tampa City Councilman looks on while Florida Gubernatorial Democratic candidate Andrew Gillum gives a campaign speech while on his "Bring it Home" bus tour at Al Lopez Park in Tampa, Florida on Saturday, October 27, 2018. When Andrew Gillum barnstormed the state earlier this year as an underdog in the Democratic primary, he consistently drew the largest, most energetic crowds of any candidate for governor. During five stops across Tampa Bay on Saturday, Gillum's supporters seemed as fired up as ever, despite lingering questions raised by newly released documents about the Tallahassee mayor's conduct with city lobbyists. After an afternoon rally attended by about 125 supporters at Al Lopez Park in Tampa, Gillum said he's not worried the disclosures will dent his support as the campaign enters the final week before the general election. The "nothing" came Tuesday, when the Republican attorney for Adam Corey, a Tallahassee lobbyist and a former ally of Gillum's, released documents in response to a subpoena from the Florida Commission on Ethics. Those documents showed that on a 2016 trip to New York, Gillum received a ticket to the musical Hamilton from an undercover FBI agent known as "Mike Miller". If someone besides Forward Florida paid for the food at that dinner, as the documents produced this week seem to indicate, the committee would have had to list the contribution in its campaign finance records. It did not. When asked whether he could produce any more records that could clear up who paid for that food — or any of the other questions about who paid for what on other trips Gillum took with lobbyists to Costa Rica, New York and Atlanta, Gillum said his campaign had nothing more to release. No major public opinion polls have been completed since the disclosures were first made public. But the controversy didn't dampen enthusiasms for those attending events in Sarasota, Bradenton, St. Petersburg, Clearwater and Tampa. Of those at Al Lopez Park who were asked about the disclosures, most seemed either unaware or ambivalent. "He's a prominent black male leader of a large city. I think they've been after him for a long time," said Terri Mahoney, 76, a retiree from Town 'N Country as she held a large homemade "Ban Assault Weapons now" sign. Gillum has said he's been told by the FBI that he's not the target of its investigation, but the ethics commission probe is ongoing — and unlikely to reach a conclusion before Election Day. If Gillum is eventually found by the commission to have received improper gifts, he would most likely be subject to a fine. If he didn't disclose an in-kind campaign contribution, his campaign could face additional fines. Gillum's Tampa supporters — like his campaign — said they weren't bothered by the disclosures. Wade N. Collins III, an insurance adjuster from Tampa, said after getting a selfie with Gillum that the Democratic nominee will be the first politician to ever get his vote. He said the disclosures were an attempt "to throw the public off of the issues that really matter." That's obviously not the view of Gillum's opponent, DeSantis. During his own campaign event in Tarpon Springs Saturday morning, DeSantis argued that the recent disclosures disqualify him from Florida's highest office. The former congressman spent much of his 20-minute speech criticizing Gillum, at one point mocking Gillum's assertion that he isn't the target of the FBI investigation. TAILYR IRVINE | TimesRon DeSantis points to the crowd during the DeSantis rally at the Saint Nicholas Community Center and Conference Hall in Tarpon Springs on October 27, 2018 in Plant City. "If an undercover law enforcement agent is going with you and is giving you a $1,000 ticket — and now it comes out that this same undercover FBI agent underwrote a fundraising dinner for Andrew for over $4,000 that Andrew never disclosed — if they were doing that as undercover agents, would they be doing that if he wasn't under investigation?" DeSantis said to a crowd of about 150. 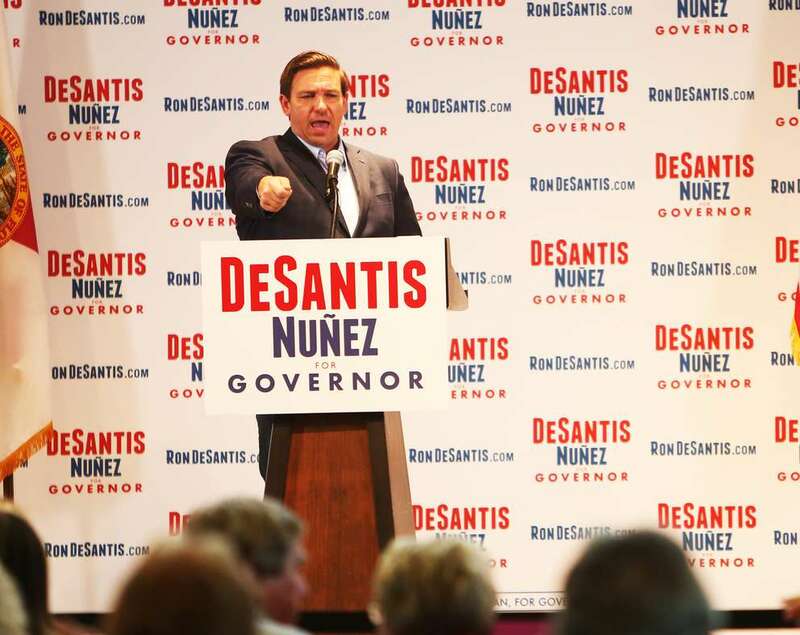 Later in the day, DeSantis held campaign events in Live Oak and Boca Raton. Aside from a few minor barbs about his recent debates with DeSantis, Gillum mostly steered clear of attacks Saturday. The Tallahassee mayor gave similar versions of the same speech in each location around Tampa Bay, calling for the expansion of Medicaid under the Affordable Care Act, more stringent environmental regulations and for a massive Democratic turnout in the November election. 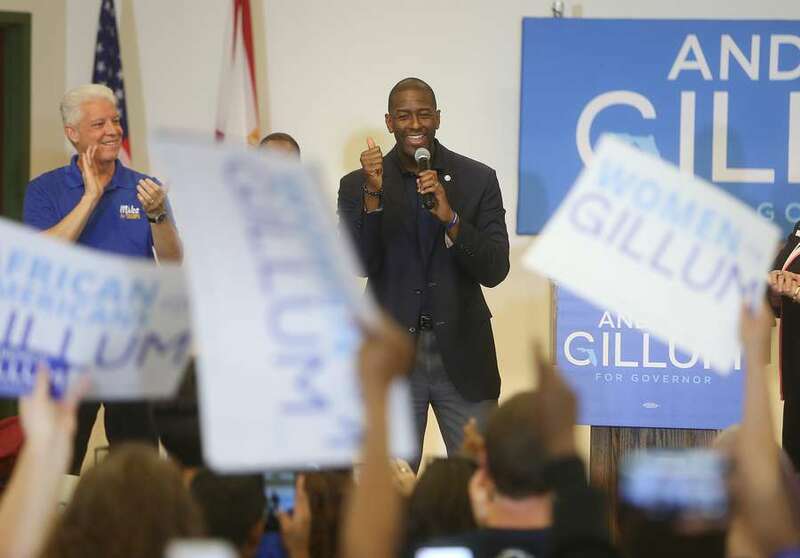 At each location, Gillum urged supporters to vote for the local Democrats running for state and federal office. Collins said Gillum is the first candidate who made him feel like his voice mattered. "There is no other person in the world I would want my first vote to be for," Collins said. Times political editor Adam C. Smith contributed to this report.